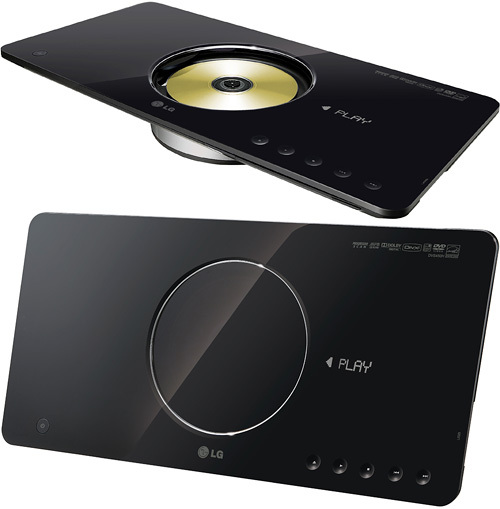 LG DVS450H – The Stylish DVD Player | OhGizmo! By Andrew Liszewski on 09/04/08 • Leave a comment! As Blu-ray DVD players gradually drop in price, how do you convince consumers to spend their money on a standard-def player instead? Well, if you’re LG, you come out with a new model that looks extremely stylish, but still has a lame corporate sounding name. The DVS450H can be used horizontally, vertically or even mounted on a wall, and features a design that’s meant to compliment today’s flat-panel TVs. Instead of a slide-out tray, a sliding door reveals where the DVD is inserted, and the glossy piano black finish is only interrupted by 5 touch sensitive buttons and a hidden LCD display. And while it can only play standard-def DVDs, the DVS450H supports the DivX HD and Xvid-H formats and will provide a full 1080P signal via an HDMI connection. The player should be available sometime in October, and will have a suggested retail price of around $238.